Get off the Koiwa station (JR Soubu Line). Turn left (towards South exit) after the central ticket gate. Go down the stairs, turn left and go straight for about 250m (3 blocks) along the street. Turn left on the street. You will see the hospital on your right after about 1min walk. It takes around 1hour 5minutes by airport limousine bus. Take airport limousine bus at the bus stop 5 on International Terminal (1F). Take airport limousine bus at the bus stop 6 on Terminal 1 (1F). Take airport limousine bus at the bus stop 6 on Terminal 2 (1F). 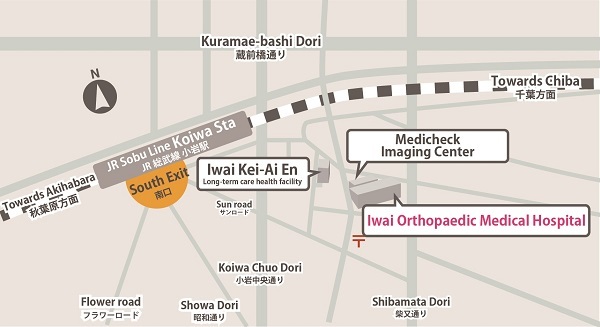 Limousine bus will arrive at Koiwa station (JR Soubu line) south exit. It takes around 1hour 25minutes by airport limousine bus. Take airport limousine bus at the bus stop 5 on Terminal 1 (1F). Take airport limousine bus at the bus stop 12 on Terminal 2 (1F). Turn right at the "Aikoku Gakuen Dori" on Kuramae-bashi Dori, go through under the JR Soubu Line underpass and you will see the hospital.We have no parking. Please use the nearby pay parking.